1 of 4 Heat oven to 350 degrees F. Place one breast half between two sheets of parchment or waxed paper on a cutting board. Pound to an even thickness of 1/4 inch with the flat side of a meat mallet, a rolling pin or cast iron pan. Repeat with remaining chicken breasts. 2 of 4 Spread out one piece of ham; pile 1/4 cup of the cheese in the middle, then tightly fold up burrito-style to enclose. Spread one pounded chicken breast with 2 teaspoons of the mustard. Place ham bundle on chicken; slide to one narrow end. Roll chicken breast, enclosing bundle. Secure with a toothpick or two; tuck in any loose ends. Repeat for a total of 4 stuffed chicken breasts. 3 of 4 Spread flour onto a dinner plate, and pour eggs into a pie dish and bread crumbs onto a second dinner plate. 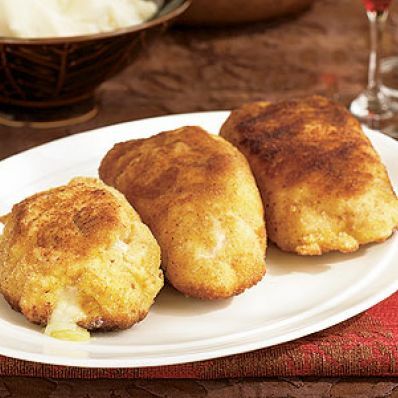 Coat one stuffed breast with flour, dip in egg completely, then coat with bread crumbs, adhering with fingers if needed. Repeat with all chicken pieces. 4 of 4 Heat oil in a 12-inch skillet with a tight-fitting lid over medium-high heat. Add chicken pieces and brown, covered, 3 minutes. Flip chicken over, and continue to cook, covered, an additional 2 to 3 minutes. Transfer to a shallow baking dish and bake at 350 degrees F for 12 to 15 minutes or until temperature registers 160 degrees F on an instant-read thermometer.